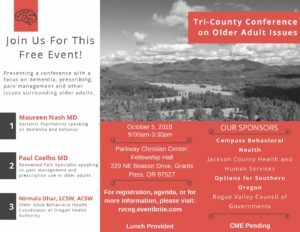 The Douglas, Jackson and Josephine County’s Older Adult Initiative is proud to bring you a Tri-County Older Adult Conference. Nirmala Dhar of the Oregon Health Authority will be introducing the day talking about the Older Adult Behavioral Health Initiative. Dr. Maureen Nash is the Medical Director of Providence Elderplace in Portland and specializes in internal medicine, psychiatry, and geriatrics. Dr. Coelho is the Medical Director at Salem Health Pain Clinic and is Board Certified in pain medicine.